Besides the infamous pumpkin spice latte, who isn't waiting all year for these?! I know I am. Maybe even a PSL and muffin together? Ok, I might go into a coma from the sugar shock. Nonetheless, I'm sure you can tell what a pumpkin nut I am by this point. I swear I'll back off the pumpkin recipes... soon... probably. 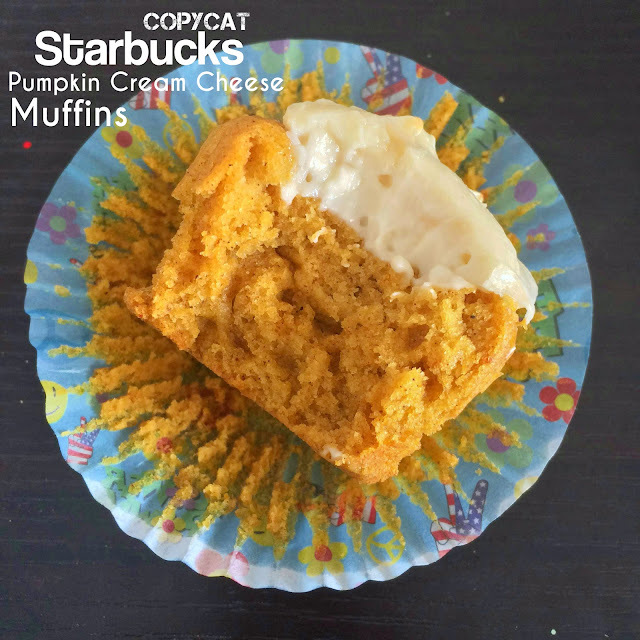 I have to admit, I actually like this recipe a lot more than the actual Starbucks version. To me, Starbucks' version has an odd texture... like super oily? Anyway, I found this version on Crazy for Crust and they are deeeelicious! Delicate with the perfect amount of spice. The little dollop of cream cheese on the top makes these absolutely delightful. They're simple to whip up. 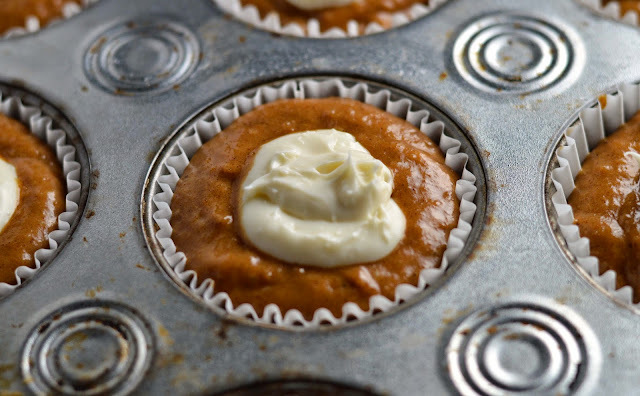 After you pour the batter in each muffin cup, simply add the cream cheese mixture right on top and bake. Preheat oven to 350°. Line muffin tins with liners. Stir pumpkin, oil, and sugar together in a large bowl. Do this by hand - don’t use a mixer. Stir in eggs, pumpkin pie spice, salt, and baking soda. Stir in 1 cup flour, then stir in milk, then stir in remaining 1 cup flour. Divide evenly among muffin pans, filling each liner 1/2 full. Stir together cream cheese, sugar, and vanilla. Drop 1 tablespoon onto the top of each muffin. Sprinkle with 4-5 pumpkin seeds, optional. Bake for about 15 minutes, until a toothpick inserted in the muffin part comes out with just a few crumbs stuck too it. Cool at least 5 minutes before serving. Store in refrigerator. I left mine out overnight to serve the next day, but be careful because of the cream cheese.